You are currently on: Get involved page. Open sub navigation overlay. We encourage all of our alumni and friends to play an active part in strengthening our Business School community and contributing to the School's ongoing success. We value the generosity and commitment of each and every one of our alumni and others who volunteer their time and expertise to support us in our work. There are many ways you can become involved that will benefit you, your business, fellow alumni, and both current and future generations of students. Give students the opportunity to hear you speak about working in your professional field. Our students gain a great deal from hearing real-life stories about the career paths and experiences of our graduates. You can also share your experience with prospective students, and help them to see what pathways they can take at the University of Auckland. Why not tell your MBA story at the MBA for a Day networking sessions? Share your knowledge and expertise with students by participating in class presentations, industry-based panel sessions and student projects. 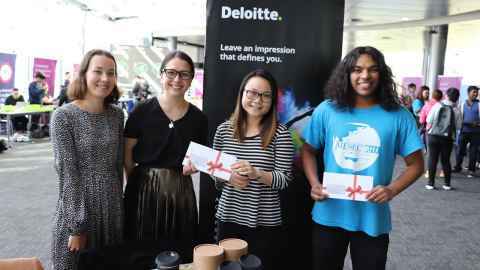 The University of Auckland Business School Women's Mentoring Programme matches female students with mentors from the Business School's vast network of businesswomen. Learn more about the Women’s Mentoring Programme. Share your knowledge and expertise with the next generation of innovators and entrepreneurs. The Centre for Innovation and Entrepreneurship runs an array of programmes – such as Velocity and Summer Lab – and they are always in need of volunteers from the entrepreneurial and business communities to bring these programmes to life. You can support students through the many activities run by the Student Development and Engagement team. The Business School ASB Careers Centre runs career speed networking events that allow you to meet students in informal settings, with opportunities for companies to raise their profile by sponsoring events. For more information, contact bizcareers@auckland.ac.nz. Case competitions provide an opportunity for students to read a business case, identify key issues, develop a strategy and prepare a presentation. We are always looking for real-life business cases, judges and mentors from our community of alumni and friends. For more information, contact Brendon Potter. The Master of International Business (MIntBus) and Master of Marketing (MMktg) programmes at the University of Auckland Business School include a five-week consultancy project, which provides a New Zealand company with an excellent opportunity to tap into the academic and professional skills of our Masters students. Passport to Business is a career development programme involving selected first-year students. We’re always looking for industry professionals to be actively involved in the programme by delivering video interview training, participating in interview simulations, guest speaking and attending networking events. Showcase your support of young talent and raise your corporate profile by sponsoring a student club or event. Many alumni have generously contributed to scholarships here at the Business School. You too can show your support for the next generation of business leaders: please visit Giving to the Business School. If you are interested in volunteering in any capacity or finding out more about any of our activities, please get in touch with our Alumni Relations Team.